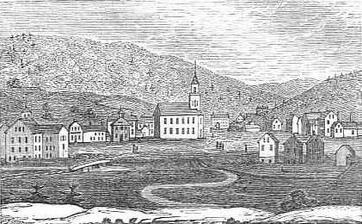 Winsted in 1836, a woodblock print drawn by John Warner Barber Settled in 1750, the city of Winsted was formed at the junction of the Mad River and Still River, and was one of the first mill towns in Connecticut. Manufactured products started with scythes at the Winsted Manufacturing Company in 1792. The city is within the town of Winchester, and its name derives from the fact that it is the business center for the towns of Winchester and Barkhamsted. Winsted, along with New Haven, Connecticut, was a center for the production of mechanical clocks in the 1900s. The Gilbert Clock Company, located along the Still River north of town, was founded in 1871 by William L. Gilbert (1806‑1890) and became one of the largest clock companies in the world around the start of the 20th century. The Gilbert School is a private secondary school that serves as the public high school for the town of Winchester. In 1955, Hurricane Connie and Hurricane Diane passed over Connecticut within one week, flooding the Mad River and Still River through downtown. The Mad River, which parallels Main Street, caused flooding up to 10 feet deep through the center of town. This damaged the buildings between Main Street and the river such that all buildings on that side of Main Street through the center of town were subsequently removed and Main Street widened to 4 lanes. The buildings on the north side of Main Street for the most part survived and were repaired. Further downstream, the Still River flowed between the buildings of the Gilbert Clock Company. The flooding caused extensive damage to their buildings, and this was the final blow to a company which was already in poor financial condition. The Northwestern Connecticut Community College was founded in 1965 by Winsted residents, including Ralph Nader's older brother, Shafeek. It occupies the original Gilbert School building. NCCC was one of the first four community colleges in Connecticut, and is accredited by both the Connecticut Board of Governors for Higher Education and by the New England Association of Schools and Colleges, Inc. The Northwestern Community College Foundation was incorporated in 1981 to support the mission of Northwestern Connecticut Community College to provide higher education to students pursuing post-secondary study. NCCF generates private funds for the purpose of benefiting the students attending NCCC and the community of Winsted.